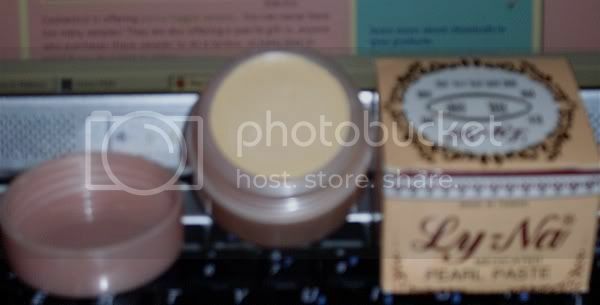 Just wanted to put in my last 2 cents on the Ly-Na Pearl Cream I purchased a couple weeks ago. I used it every day for a week before giving up on it. It's not a bad product, it just didn't do anything for my skin. I would put it on at night and left it on for a minimum of two hours. I didn't want to sleep in it since I would get it all over the bed. After using it for a few days, I noticed that I had a layer of dry skin that I didn't have before I started using it. If you have oily skin, this might be useful. I tried using it on a pimple I had squarely between my eyes (wouldn't you figure, a pimple bullseye). The cream didn't do a thing for it and the pimple ran it's usual course. I guess I'll go back to searching for that elusive Paraben-Free miracle cream out there! most reviews i've heard is that they leave it on over night for it to actually work. also they used it for about a month at least to let the magic actually work. many of them had deep scaring on their face as well. if you're looking to make it disappear right away, you minus well use toothpaste over night on the one area. i heard that works b/c my friend does that. also your skin might have been peeling because you didn't let the cream sit in long enough to actually work, as in you took it out while the cream was working on your skin therefore the irritation and maybe flammation towards your skin therefore the dryness of it. also the consumers rubbed it in their faces for at least one to two minutes to really work it in instead of having a thick layer on it b/c its not good for the skin i hear. i usually notice that when my friends go on medication for their acne, their face as well begins to peel off and stuff, but after the peeling and breaking out their skin turns out flawless. maybe this is a similar affect?